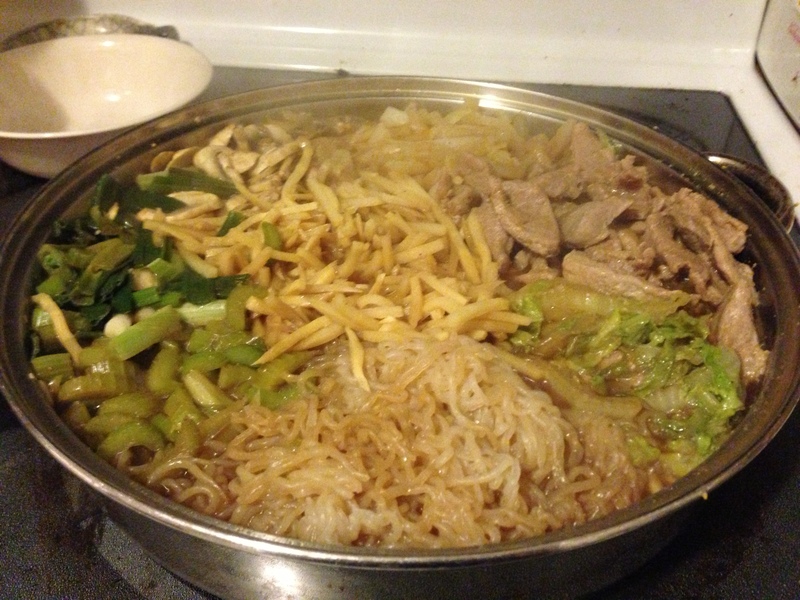 Sukiyaki is always a huge hit in my home, probably because it tastes fantastic and is very satisfying. It is a Japanese dish that consists of thinly sliced meat, vegetables, and shiritaki noodles cooked in a slightly sweet broth. It’s pretty simple and straightforward to make. All you need is a large (5 qt. or larger) lidded saute pan, either flat or curved sided. There are a lot of possible variations of ingredients, but this is my low-carb, sugar-free recipe. 1 1/2 pound thinly sliced beef or pork, Slicing the meat is easiest if it’s partially frozen. Get it as thin as you can while keeping the slices a consistent width. minced garlic, 2T if pre-minced, 3-4 cloves of fresh. The actual cooking time involved in this dish is quite short, so everything needs to be ready to go before you start. Prepare the shirataki noodles by putting them in a bowl and covering them with boiling water for a few minutes, and then drain them. You can squish them with your fingers to separate them if they’re still stuck together from packaging. Mix the soy sauce, Splenda, beef broth, and rice vinegar together. I think it’s easiest to combine them in a liquid measuring cup, because you can combine and measure in one step. Slice all the vegetables, keeping them separate. You can put them in different bowls, but I’m usually able to fit them all on one cutting board. Bamboo shoots come in a can. Drain them and set them aside with the vegetables. Add oil to the saute pan and heat it on medium-high heat, like you would for stir fry. Brown the meat, and remove it from the pan. Add the onions and garlic to the pan next and saute until the onions start to turn transparent. You don’t need to cook them until they’re entirely cooked through. Move the pan off the heat while you arrange the rest of the ingredients in the pan. Move the onions and garlic to a corner of the skillet. Pile them as compactly as possible with the top of the pile almost level with the top of the pan, and then put the meat in next to the onions. Add other vegetables, going around the skillet and keeping each separate. I usually save the bamboo for the last and I put in in the center. You’ll have to push pretty firmly to get everything to fit in the pan. When you’re done, pour the broth over the ingredients and return the pan to the heat. Put the lid on and cook for 3 minutes. Flip all all ingredients over with tongs (it’s ok if you miss a few pieces), and replace the lid and cook 3 more minutes. To serve, put a bit of each ingredient in a bowl, and add some of the broth. The recipe makes 4 generous servings. 1/4 of this recipe is about 475 calories. Other low-glycemic vegetables that would be good: radishes, bean sprouts, bok choy, zucchini, greens (spinach, mustard, kale, chard), leeks, tomatoes, snow peas, bell peppers, jicama, or water chestnuts. For a meatless dish, fill up the rest of the space with vegetables, and crack 5-6 eggs over the vegetables before putting the lid back on and cooking the final 3 minutes. If you’re not concerned with carbohydrates, you can add tofu, which is a traditional ingredient.